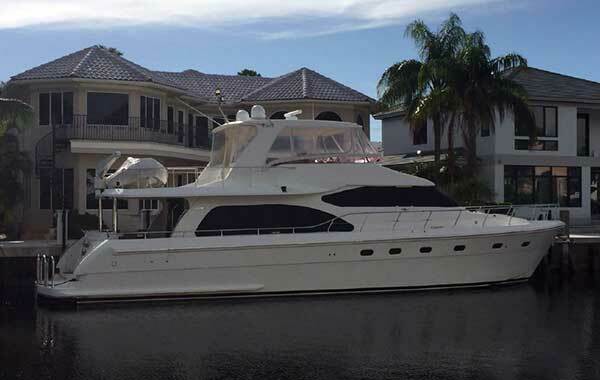 68 Hampton Pilothouse Motor Yacht for Sale "El Coyote"
"El Coyote" A fully equipped 680 Hampton powered with CAT C-18s. She also features Kevlar Construction in hull and forward collision zone, full Strataglass flybridge enclosure with air-conditioning, 2 generators, stabilizers, bow and stern thrusters, and a custom designed interior. Accommodations include 3 staterooms and 3 full heads plus separate crew quarters with head & shower. Contact Ed anytime in the Ft. Lauderdale office. His cellular phone number is (954) 646-1609 or email ed@qualityyachtsforsale.com.